"You may be a doctor but I am THE Doctor. The definite article you might say." For the first time in some years, Doctor Who was on TV for the majority of the year. Since 1970 each new season had traditionally began in January (or occasionally late December) and then ran for about 6 months or so. This was also the case with the Season 12, Tom Baker's first season. However the decision was then made that Season 13 would start in August 1975 and run through to early 1976. What this meant for the production team was a very quick turnaround between seasons in 1975 which caused a few headaches. For the viewers it just meant that they didn't have to wait as long between seasons. But I'm getting ahead of myself. Season 12 began with the imaginatively titled 'Robot', written by out-going script editor Terrance Dicks. In this story the new, unfamiliar Doctor is surrounded by familiar characters and situations, intended I assume to give the viewing audience the chance to adjust to the new Doctor without being too overwhelmed. 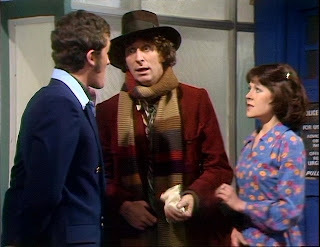 So the Brigadier, Benton, Sarah Jane and even the Doctor's car Bessie are all present and correct as the Doctor investigates a group of rogue scientists who are looking to control the world using, amongst other things the titular robot. It's all in a day's work for this Doctor who, compared to his predecessor, seems to have a far more laid back attitude to danger. He seems to take everything in his stride greeting the danger with a big smile. Even when the robot is accidentally turned into a giant, the Doctor doesn't panic and quickly rustles up a handy chemical solution that shrinks the robot back down to size. There is one other new addition to the regular cast in this story, Surgeon Lieutenant Harry Sullivan, UNIT's chief medical officer who initially takes care of the Doctor after his regeneration. He also proves to be a handy spy, going undercover to infiltrate the group of rogue scientists. 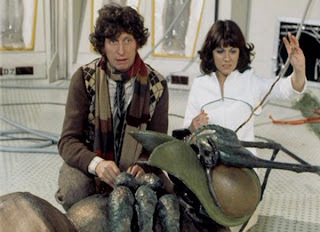 At the end of 'Robot' the Doctor offers to take the sceptical Harry on a trip in the TARDIS with himself and Sarah Jane. And so Harry becomes the latest of the Doctor's travelling companions. 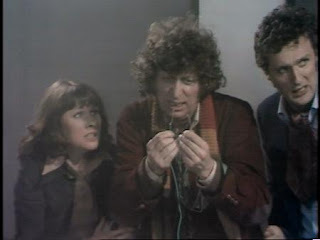 At the end of 'The Ark in Space' and with the Wirrin vanquished, the Doctor, Sarah and Harry beam down to the abandoned planet Earth to see if it's safe for the remaining humans to return home. 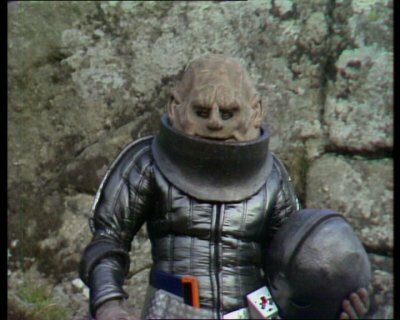 This leads into a short, two episode story called 'The Sontaran Experiment'. Here, the travellers find that Earth is now a bleak desolate world inhabited by a few stranded space travellers and a lone Sontaran warrior who is conducting some nasty experiments. Made on the cheap and filmed entirely on location in Dartmoor, this story is particularly notable as Tom Baker broke his collar bone during filming, requiring a cunningly disguised stuntman to double for the Doctor in a lot of the more energetic scenes. 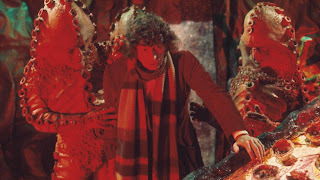 Having taken care of the Sontaran, the Doctor and his friends appear to beam back up to the Ark but instead they are transported by the Time Lords to planet Skaro in order to witness the 'Genesis of the Daleks'. 'Genesis...' is rightly called a classic story by many fans. 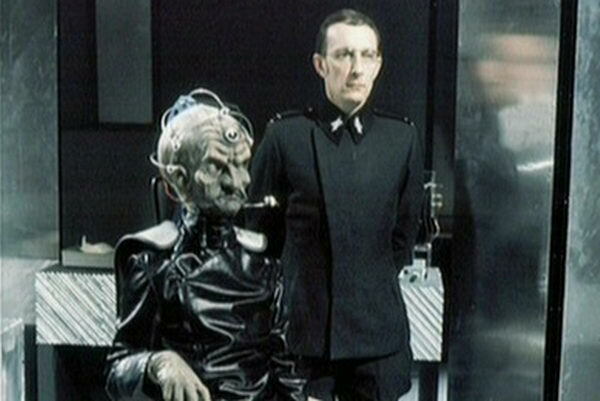 Not only do we witness the creation of the Daleks themselves but we also meet the evil genius by which all future evil geniuses will be measured, their creator Davros. The crippled genius who when we first meet him is already half way to being a Dalek himself is mad, bad and dangerous and is not above wiping out his own people in order to give his new creations a chance to live. 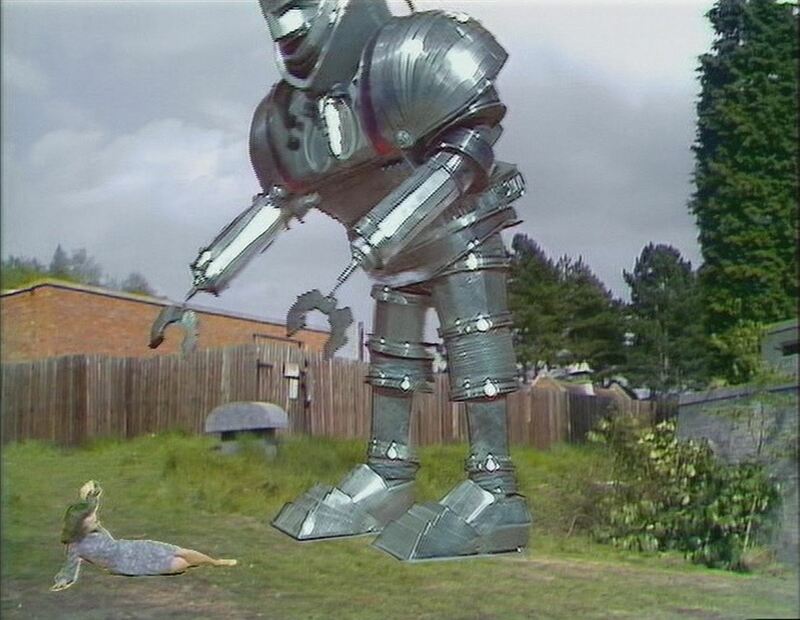 The Doctor's mission from the Time Lords is to stop the Daleks' creation, leading to a much quoted scene where the Doctor debates whether he has the right to wipe out an entire species. In the end, of course, he doesn't wipe them out but he does set back their evolution somewhat and Davros finds himself on the wrong end of a Dalek gun. Invevitably, Davros would prove too popular to stay dead for long. Finally, in 'Revenge of the Cybermen', the Doctor, Sarah and Harry return to the Ark using a Time Ring supplied by the Time Lords. However they arrive back at an earlier period of time than they left, when the Ark wasn't an Ark but merely a space station called Nerva Beacon. The crew of the Beacon are being wiped out by a mysterious disease which the Doctor discovers is being caused by the Cybermen who are looking to take over the Beacon. 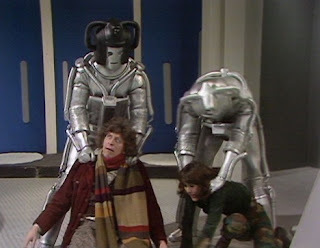 It's here that we first discover that the Cybermen have an aversion to gold as it turns out that the Cybermen want to use the Beacon in order to launch an attack on Voga, the planet of gold. The Doctor and his friends manage to prevent the attack and defeat the Cybermen. Finally they are reunited with the TARDIS and head off back to Earth to answer a call from the Brigadier. Originally, the next story 'Terror of the Zygons' was to end Season 12 but, when it was decided to move the debut of Season 13 to August, the story was moved to the beginning of that Season. This meant that Season 12 ended on something of a cliffhanger. What was the Brigadier calling the Doctor for? Where has he summoned the TARDIS crew to? All would be revealed. However urgent the Brigadier's summons was it would appear that the Doctor felt that he had time to introduce an episode of 'Disney Time' in the break between seasons. For those too young to remember, 'Disney Time' was a children's programme where a celebrity host would introduce a number of clips from classic Disney animations and films. Tom Baker introduced the edition of the programme shown on 25 August in character as the Doctor. In a neat bit of continuity, at the end of the programme is handed a note "from the Brigadier" requesting his assistance. And so the Doctor heads off to answer the summons. Five days later on 30 August, the Doctor was back for Season 13 and the held-over 'Terror of the Zygons'. This has always been a popular story amongst fans and the Zygons have been popular monsters despite the fact that this was their only TV appearance. One of the main reasons for their popularity is their look which is, it must be said impressive, particularly when coupled with their hissing voice. The story itself though is also very memorable. Set in Scotland close to Loch Ness, the story sees the Doctor and co investigating the destruction of oil rigs by a huge beast. Yes, this is the story with the Loch Ness Monster in it. The monster has actually been created by the Zygons who are destroying the rigs. 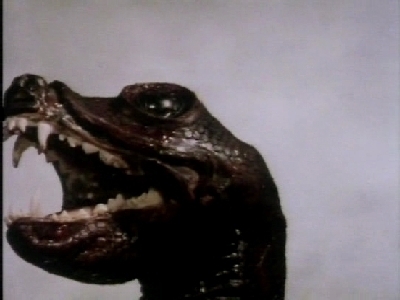 In addition, the Zygons themselves are shape-shifters and are using their abilities to try and take over the world. The whole thing climaxes with the Doctor confronting the Loch Ness Monster who has appeared in the River Themes and sending it back to Scotland. This is also where we bid goodbye to Harry Sullivan, who decides that he's rather take the train than travel in the TARDIS again. It won't be quite the last we see of him as he does appear briefly later in the season. The same is also true of Sergeant Benton. 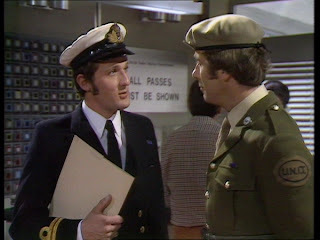 As for the Brigadier, who has been such a regular presence since the late 60s, we won't see him again until 1983. This definitely does feel like the end of an era. For the Doctor and Sarah, though their travels continue. In 'Planet of Evil' they travel to the far future and a distant planet where a group of scientists have discovered traces of anti matter. 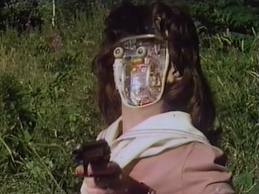 Unfortunately the anti matter causes one of the scientists to transform into an anti matter monster and the Doctor has to defeat it. 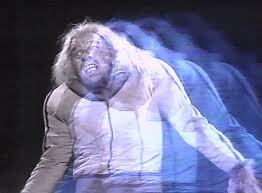 The story is strongly influenced by 'Doctor Jekyll and Mr Hyde' in the transformation of a scientist into a monster. It won't be the last time that this era is influenced by classic novels. In the next couple of year's we'll see homages to 'Frankestein' and 'Phantom of the Opera' while the very next story 'Pyramids of Mars' pays tribute to classic horror movies. 'Pyramids...' is another of the most popular Doctor Who stories. Set in 1911, it sees the Doctor and Sarah trying to stop an Egyptian 'god' from being released from his prison all the while trying to avoid the Egyptian mummies that are stalking the grounds of an English country house. It's hard to sum up what makes this story so good. As with most popular stories it's usually because everyone (writers, directors, designers, actors etc) are on the same page and manage to make everything come together perfectly. 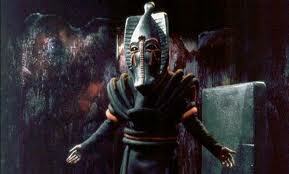 For me, the highlight is the main villain Sutekh the Osiran. He's not really an Egyptian god - he's just mistaken for one - but he's immensely powerful and immensely evil. With some villains and monsters it's easy to believe that they have some morals. Even the Master wasn't all bad. But Sutekh has no redeeming qualities whatsoever. He even says to the Doctor at one point "your evil is my good." And his voice is perfect. Played by Gabriel Woolf, he is quietly menacing and doesn't rant and rave like, for example, Davros. And for someone so powerful why should he need to rant? 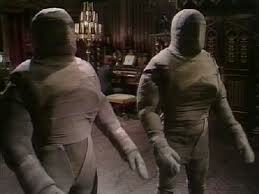 In a way, it's a shame that Sutekh doesn't appear again in the series but perhaps this is one case where less is more. Finally, in this mammoth year of Doctor Who on TV, we come to 'The Android Invasion' - written by Dalek creator Terry Nation and directed by former producer Barry Letts. 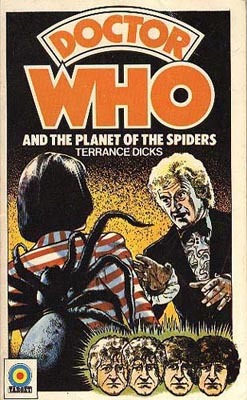 This is a rare non-Dalek story from Nation and, to be honest, it will not be regarded as one of his better works. The androids in question are robotic replicas of human beings that have been created by the alien Kraals in their attempt to invade Earth. This story is particularly notable for being one of the last appearances of UNIT. The Brigadier himself is absent in Geneva and one Colonel Faraday is deputising for him. Benton and Harry Sullivan (or at least android replicas of them) also make their final appearances. Once again nothing this year. The Target novelisations continued apace with seven books published this year. 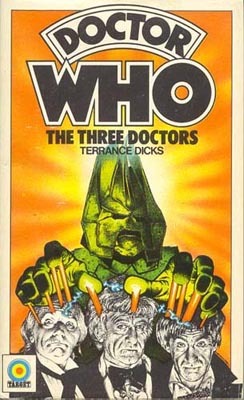 Terrance Dicks wrote four of the books, including an adaptation of the first Fourth Doctor story 'Robot' (re-titled 'The Giant Robot') which was published just two months after it had been shown on TV. He also authored, 'The Three Doctors', Terror of the Autons and 'Planet of the Spiders'. 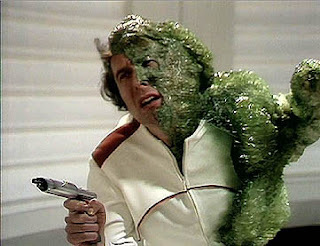 Joining Dicks was Malcolm Hulke, who novelised 'The Green Death', former script editor Gerry Davis who novelised Second Doctor story 'The Moonbase' (retitled 'The Cybermen') and Brian Hayles, who novelised his own scripts for 'The Curse of Peladon'. Other books published this year was the standard Doctor Who Annual as well a Dalek Annual for the first time since the 60s. 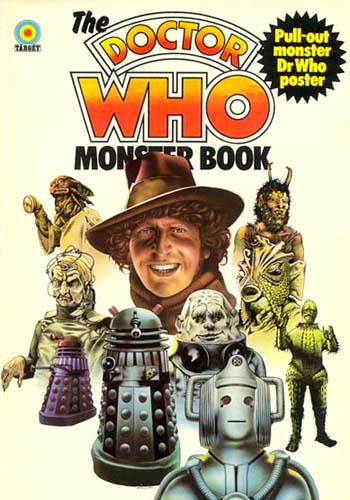 Finally, November 1975 saw the publication of the Doctor Who Monster Book, a non fiction book that contained information on a variety of monsters and villains from the series' history. The TV Comic strip continued throughout 1975 with the new Doctor taking centre stage alongside Sarah Jane - the first time a TV companion had been seen in comic strip form since the Brigadier and Liz back in 1970. Just in case readers had forgotten, the opening instalment of 'Death Flower', the first 4th Doctor strip, included a brief write-up of 'Planet of the Spiders' to remind people of why Jon Pertwee was no longer starring in the strip. The new Doctor in the strip is very unlike his TV counterpart, somewhat moody and patronising towards Sarah Jane. 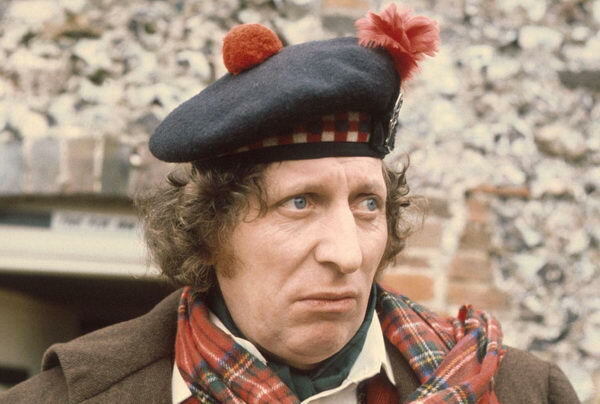 Part of the reason for this, I suspect, is because the early strips were being written before Tom Baker had made his first full appearance on TV so it was probably almost impossible for the writers to judge what sort of character this new Doctor was going to be based on just a few publicity photos. In notable highlights from this year's strips, we see not one but two appearances by the Daleks, a trip back in time to the nineteenth century and the returns of a villainous race that was last seen in the strip when it was being published in Countdown in 1972 - the blue-skinned Mekon lookalikes the Vogans.